Tyra Nickson, left, and Gary Hammon prepare a special dish during lab time in Culinary Prep. Katelyn Johnson, left, and Haley Butts, right, practice nail care and preparation, a vital part of cosmetology. 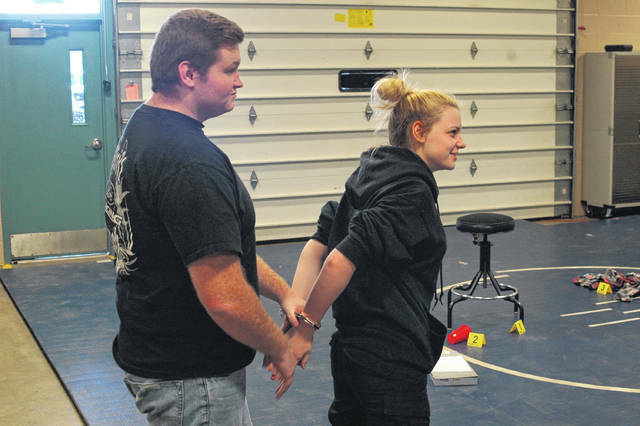 Trey Rossiter practices detaining a suspect with handcuffs on fellow student Taylor Friend. RIO GRANDE — The Human Resources Academy at Buckeye Hills is another option for those interested in developing employable skills in a variety of fields. The Human Resources Academy has four programs, Early Childhood Education, Cosmetology, Culinary Preparation, and Criminal Justice. Early Childhood Education program is designed to train students for a wide range of careers, including certification to operate and direct a child daycare center. Students can become certified as a licenses teachers aid, a teacher, or any career path concerning education of children from birth until first grade. The program offers a wide variety of options for students who hope to work with young children. “I love kids and this will be better for me in the future. It will train me to be a teacher, teachers aid, or pretty much anything teaching related. I plan to graduate from here and become a teachers aid,” said Cheyanna Wiseman. Students who pursue cosmetology can earn an Ohio Board of Cosmetology license and begin working in their field upon graduation. Students have to spend 1,500 hours in classroom instruction and pass the board examination in order to be licensed. “I have always wanted to be a cosmetician. I have always had an interest in making people look pretty,” said River Valley student Katelyn Johnson. 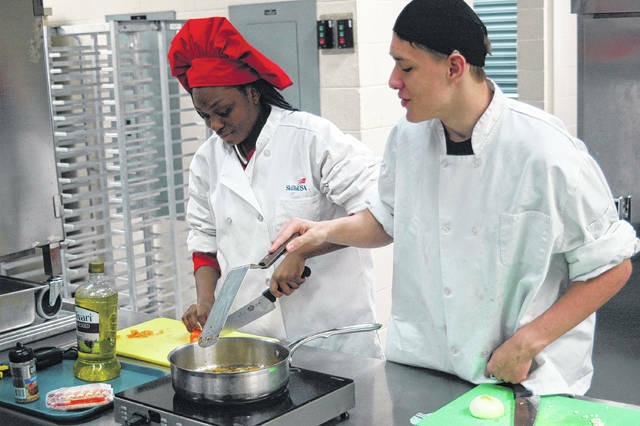 Culinary Preparation has been a popular program at Buckeye Hills for several years, offering students the chance to work in a field that is rewarding. Students have the chance to earn multiple certifications, including the Prostart certification, Safe Serve, and the Career Technical certification. The program uses the two year curriculum from Prostart, which trains and prepares students for work in the culinary field and restaurant industry in multiple roles, from management to food preparation. “I want to own my own restaurant someday. I’ll leave here and get a job,” said Gary Hammon. “Students can leave here and get a job in the culinary field right out of high school. We use the curriculum and tailor it to the students’ goals,” said instructor Tim Bartee. Another popular program in the Human Resources Academy is the Criminal Justice program. Students learn about a variety of fields here, from crime scene investigation to interviews and interrogations, students get a head start in the criminal field. Students can go into jobs including correctional officers, patrolman, or further education as investigators. “Hopefully for the future I can be a police officer or a detective with the Gallia County Sheriff’s Office. My favorite part of this program is the fingerprint lifting and the skills competitions,” said Gallia Academy student Trey Rossiter. As with all programs at Buckeye Hills, these are all two year courses and are available for free to high school students. To learn more about the programs they offer, visit their website at buckeyehills.net or call them at 740-245-5334.